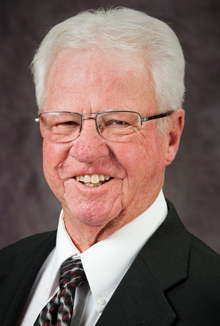 If one were to ask Fred O. Bradley (MEd ’70, counselor education; PhD ’72, counselor education) to name his greatest point of professional pride as he closes out a fulfilling, 40-year teaching career at Kansas State University, chances are his response would point to the successful lives of graduate students he has taken under his wing. They’re his kids, he says, and his accountability to them is a lifetime commitment. Bradley has mentored myriad students across his distinguished career at KSU. Fred joined the faculty in 1972, as assistant professor of counseling and student personnel services. Following promotion to associate professor, and a visiting professorship in the University of Nevada-Las Vegas Department of Special Education, Bradley assumed his first administrative role, as coordinator of counseling and student personnel services in the KSU Department of Administration and Foundations. He chaired the KSU Department of Counseling and Educational Psychology and Educational Psychology and served as coordinator of graduate studies for the KSU College of Education. Since 1981, he has served as clinical coordinator of the college’s Counseling and Student Development Program and its CACREP (Council for Accreditation of Counseling and Related Educational Programs) liaison. When Bradley left UW to begin his faculty career at KSU, he had two major professional goals: to be registered in the Library of Congress, to preside over the Association for Counselor Education and Supervision and become board certified by the ACES Counseling Division. He fulfilled the first goal, as author of two books. He fulfilled the second goal, serving as ACES president in 2001. Among those new opportunities: frequent invitations to speak and lead workshops on a range of issues related to counseling children and youth. His outreach covered the state of Kansas and beyond, educating communities and the professionals who serve them about critical counseling and education concerns focused on supporting young people. He also served the profession in a variety of leadership capacities. Besides presiding over ACES, Bradley also led the Kansas Association for Counselor Education and Supervision and chaired the Kansas Association for Specialists in Group Work. He chaired numerous committees and work groups for state and national organizations. Fred’s list of publications – books and journal articles - expands his lasting impact on the profession via the written word. Peers recognized Bradley’s myriad contributions to the profession in 2011, with his induction into the Kansas Counseling Association (KCA) Hall of Fame. The honor is bestowed upon only one counselor per year. He also was named Kansas Counselor of the Year (2000) and recipient of the North Central Association for Counselor Education and Supervision Distinguished Professional Service Award (1998), KCA Distinguished Service Award (1995), and ACES Graduate Student Mentor Award (1988). Fred and his wife, Nancy Jo, have one daughter.